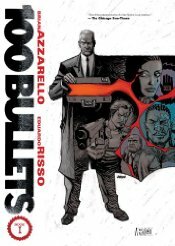 Collects first three 100 BULLETS volumes in one! It's a thing DC's doing now. Gripping conspiracy crime fiction which, initially, looks simple enough: Agent Graves, a man of almost pensionable age in a suit and tie, arrivals on your doorstep with a briefcase. In that case is irrefutable evidence that someone has seriously screwed you over plus the culprit's identity. There's also a gun and 100 rounds of untraceable ammunition. By "untraceable" I mean that if even a single bullet is found at the scene of any crime, investigations into it will cease immediately. How is that possible? Why is he doing it? Would you use that gun, knowing you could get away with murder? As the series progresses it becomes increasingly evident that this isn't a game, it's not even a private obsession. It's a war. Strings are being pulled while ties have already been severed; activations occur, more revenge is sought, but neither the original victims nor on occasion the original perpetrator are necessarily unconnected to Graves's past or present. And some of them haven't a clue they were victims, let alone connected. There's Mr. Shepherd, the Trust, the Minutemen and their history. There are several long-games in play. So clever is this that there's a stand-alone chapter in the next book containing two seemingly separate stories seamlessly interwoven and choreographed across a single park, and I cannot fault a word of dialogue. Azarello's ear for dialect is superb. He has every nuance, every cadence of urban street patter down to perfection. 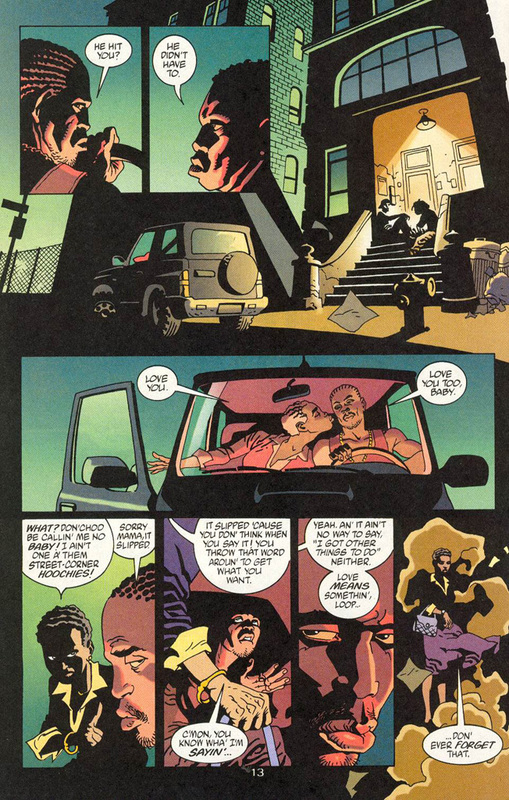 In the final story arc here we are introduced us to Loop, a young black guy raised in Philadelphia by his Ma, and whose Father is just someone she refers to. Loop talks the talk (and the talk is captured to the very syllable, with its own lyrical beauty), but so far he's not yet walked the walk, though he teeters alarmingly close. A fine time for Agent Graves to tip the balance, providing Loop with an opportunity to meet the father he's never known and resents, but for whom he constantly yearns. Unfortunately his Father turns out to be equally rudderless, collecting debts for a gnarled old loan shark, and although reconciliation does seem possible, they may well end up being the death of each other. Recommended to readers of CRIMINAL and STRAY BULLETS. And indeed vice-versa. 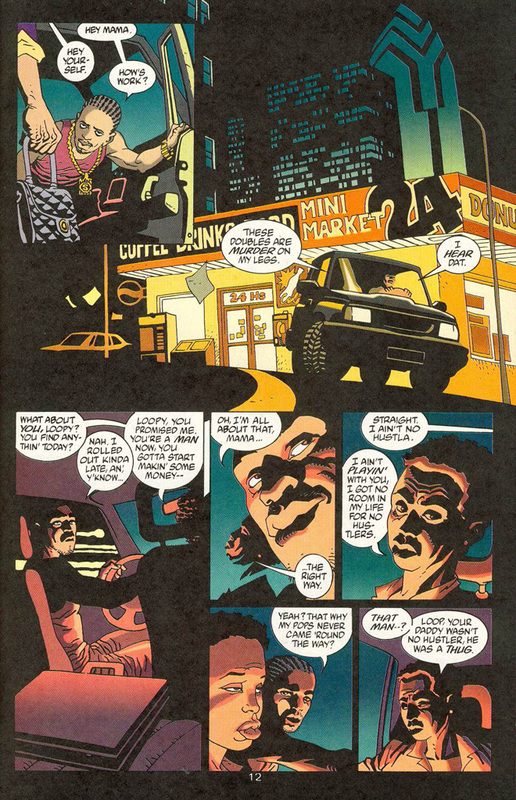 Risso's art is an essay in silhouette and shadow, so it's recommended to SIN CITY patrons as well. There will be much more on Risso and the colouring so close that you can hear the cicadas anon.